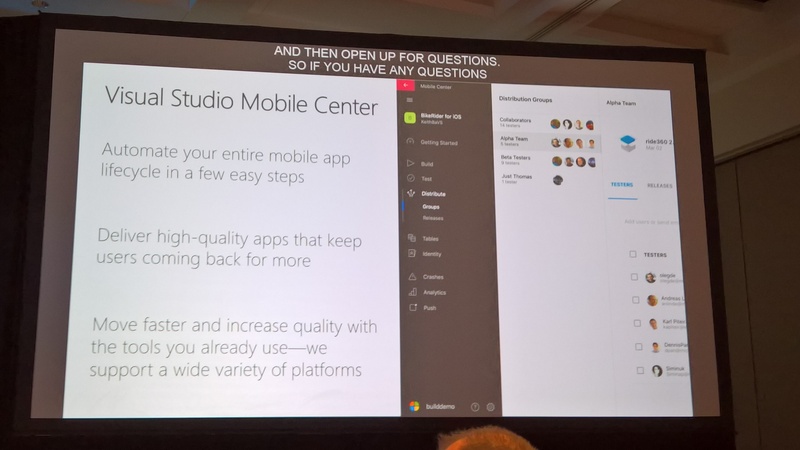 This session presented the new Visual Studio Mobile Center that aims to bring into a single place every aspect of continuous integration and delivery as well as every services used in mobile development like authentication and push notifications. In a few simple steps, we can quickly setup a continuous build on each push to a git repository (hosted in GitHub, VSTS, BitBucket). Then UI tests will be run by Xamarin Test Cloud, and finally the app can be distributed by Hockey App. Also we are given 2 lines of code to add to our apps to enable Application Insights. All that without leaving Mobile Center. It supports Xamarin.iOS, Xamarin.Android, Objective-C, Swift, Java, ReactNative and UWP apps. Cordova is not supported for the moment. 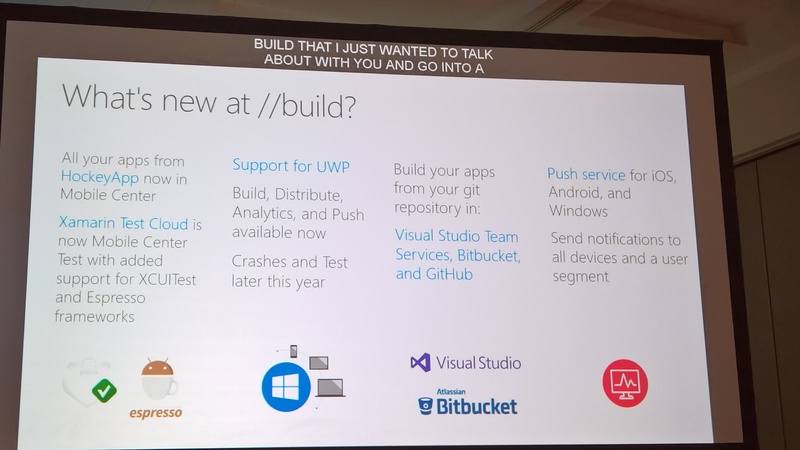 The build agent is hosted in the cloud, which means that we don’t need to have a Mac to compile iOS apps. This service is still in preview and free for the moment. No pricing available as of now. Another session packed with lots of sweet things, especially for me who loves XAML/UWP and UX design. I recommend that you watch the replay as it’s a really visual session, difficult to transcribe by words. This session presented all the new concepts of Fluent Design and how to implement them in XAML for UWP.